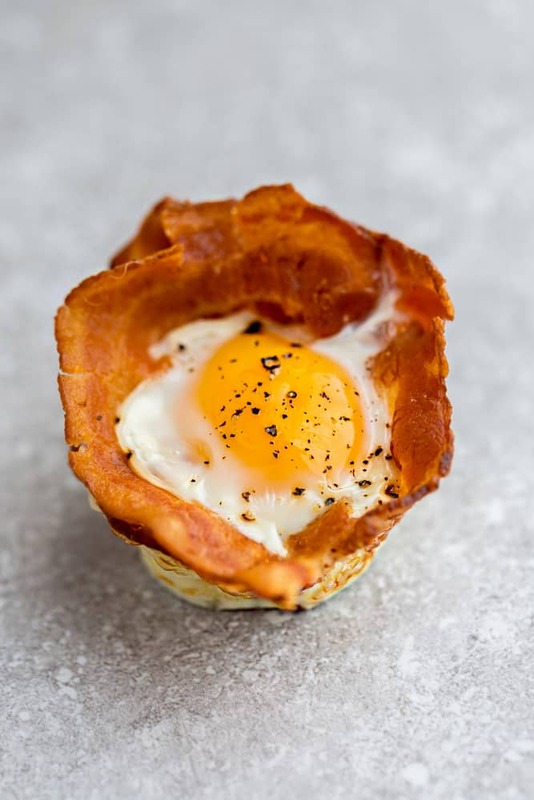 Bacon Egg Cups are an easy make ahead breakfast, brunch or snack perfect for busy on-the-go mornings. A low carb recipe made with just 4 simple ingredients and is Whole30, paleo and keto friendly. Eggs for breakfast happens a lot around here. They are packed with protein, nutrients and low in carbs. Plus, they are super versatile and paleo, keto and whole 30 compliant. WHAT ARE BAKED EGG CUPS? 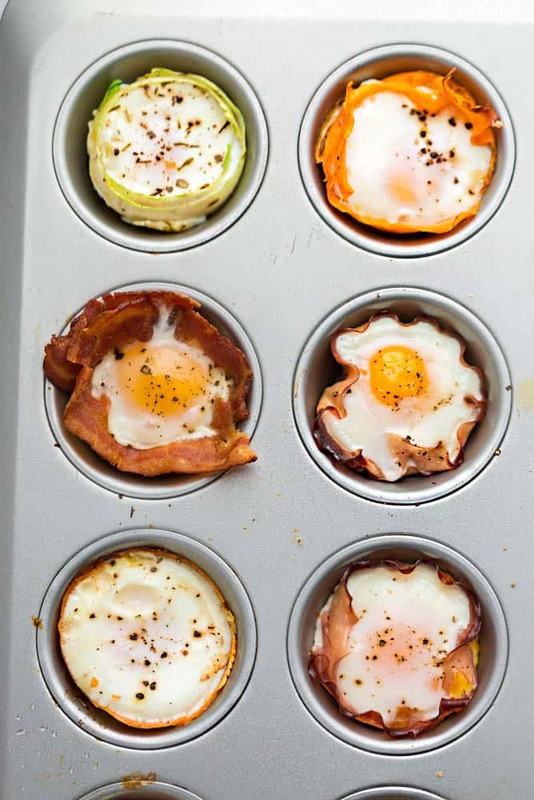 Baked egg cups are simply eggs that you bake in a muffin tin and they work perfectly as a single-sized breakfast or snack for on the go. 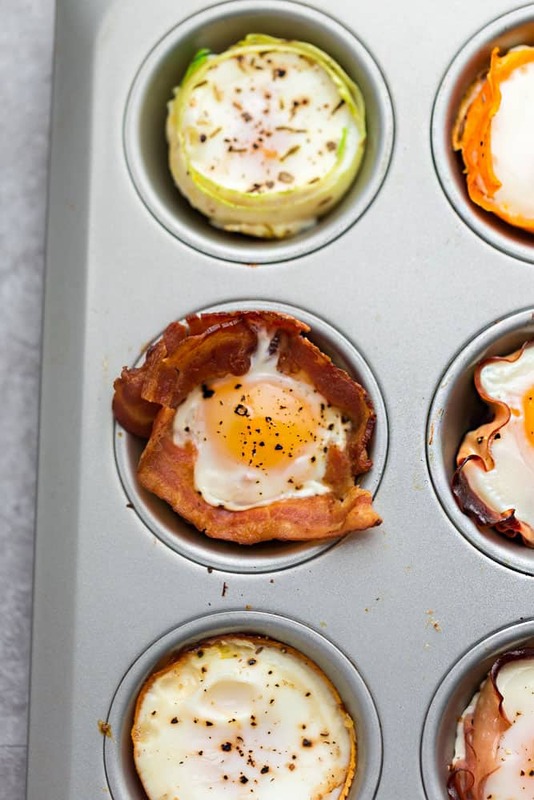 Today, we’re featuring these low carb Bacon Egg Cups. These egg cups are super simple to customize and take no time at all to whip up. You’re only going to need 2 main ingredients and then you can add in any other seasonings of your choice. So how do you make a baked egg? Baking eggs in the oven is one of the easiest and most hands-off methods. 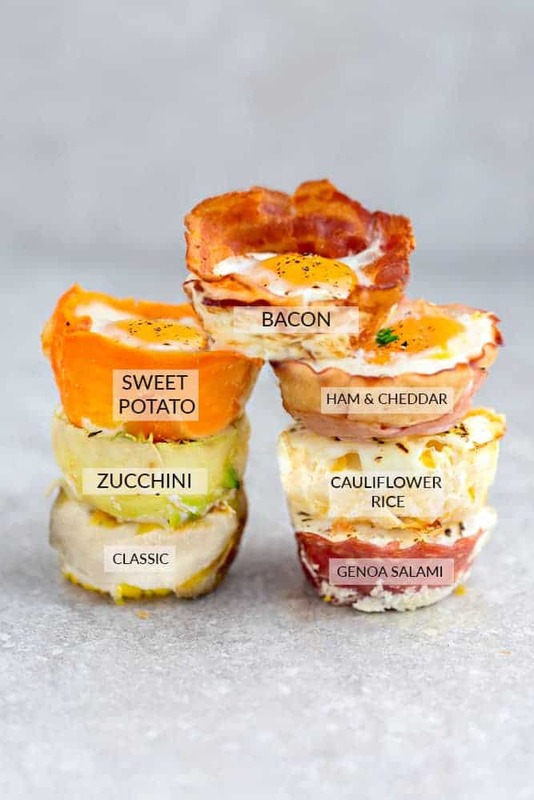 You’re going to start making these baked egg cups by lightly greasing or lining a 12 cup muffin tin with silicone liners. Partially cook your bacon either in a pan, air fryer or oven. You don’t want them to completely cook, otherwise they will be too crispy when cooked with the eggs. Pat dry and arrange each slice of bacon around each the edge of each muffin cup, creating a a circle. Crack an egg into each muffin cup and season with salt and black pepper. Sprinkle cheese, chopped parsley and dried herbs of your choice. Bake at 375 F for 12-15 minutes or until egg whites are set and no longer jiggly. HOW LONG DO EGGS TAKE IN THE OVEN? These baked eggs cook up in about 12-15 at 375 F in the oven. Eggs are naturally low in carbs and full of protein and fit perfectly into many healthy lifestyles. WHAT IF I PREFER OMELETTES OR OVER-EASY FOR THESE BAKED EGG CUPS? Sure. If you don’t like over-easy eggs, feel free to whisk the eggs in a 4-cup measuring cup or a mixing bowl. Add any other seasonings you like. Chop up your favorite combo of veggies and proteins and mix until combined. You can even do a combination of egg whites and eggs if you’re trying to cut down the macros. Divide evenly among muffin cups (about 1/2 – 2/3 cups full) and sprinkle with any additional toppings. in advance and pour into the muffin tins to make mini omelets. 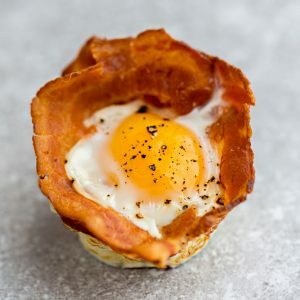 HOW CAN I MAKE BACON EGG CUPS AHEAD OF TIME? Scrambled eggs are definitely a great freezer-friendly breakfast option. However, since these Whole30 bacon eggs cups are made with over-easy eggs, it’s best to serve them on the same day. Preheat oven to 375ºF and grease or line a 12 cup muffin pan with silicone muffin liners. Cook bacon partially according to your preferred method - pan, oven or air-fryer. You don't want it fully cooked otherwise, it will get too crispy when you bake it with the eggs. 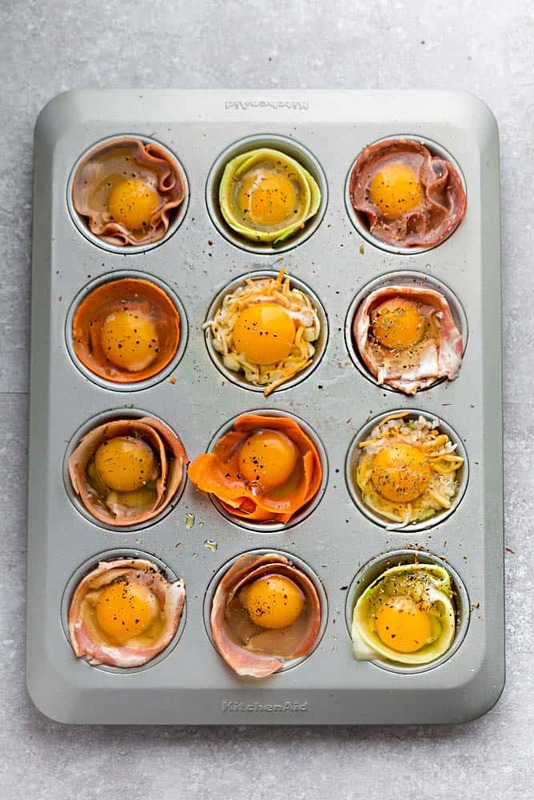 Crack an egg into each muffin tin. Season with salt and pepper. Add optional seasonings or toppings. Bake for 12-15 minutes or until eggs are firm. Remove and serve hot. 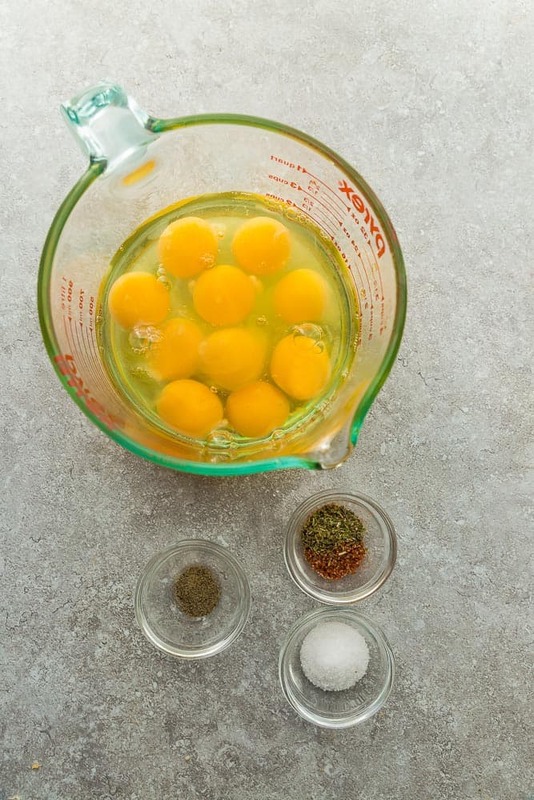 Crack the eggs in a large measuring cup (feel free to swap out some whole egg with egg whites, if preferred). Season with salt, pepper, and herbs of your choice. Pour mixture into muffin cups, dividing evenly amongst each cup.